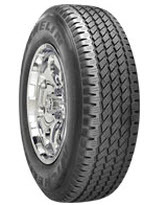 The Michelin Cross Terrain SUV tire is built specifically for SUV’s, Crossovers and light trucks. Michelin has taken some of the best features in their performance car tire lineup and added them into the Cross Terrain. The end result has worked out very nicely for SUV owners. The Cross Terrain SUV has the looks of an off road tire with its aggressive posture that indicates that it can take on tough terrains if need be. It is built to drive well on highways, but can also tackle some off road conditions as well, making this a very versatile tire. The Michelin Cross Terrain SUV Tire has a sophisticated silica enhanced tread compound that enables it to have excellent grip on either dry or wet pavement. Better still, this unique tread compound is very smooth and provides a superior level of comfort that will likely surprise you once you drive on it. The handling on the Cross Terrain SUV tire is solid, due to a square and stable contact patch with a greatly improved casing system. Even at higher speeds you will feel absolutely safe with this tire. It also has interlocking sipes which help improve traction on wet roads and light snow. A combination of the sophisticated tread compound and interlocking sipes result in a quiet ride, making it one of the quietest Michelin tires in its category. Michelin has used its Durablack technology, which is an advanced technology incorporated in the compound that makes the tire’s sidewall remain black during the entire life of the tire. You won’t get the fading that you normally do with other tires. With this technology your tire will look new right up to the end of its life. It really gives the Cross Terrain SUV a unique look which cannot be found on other tires. Continuous shoulder tread ribs on the Cross Terrain SUV enhance the life of the tire and save you money in the long run. Twin steel belts, reinforced with a two ply cord body, support the tire and make it stable at high speeds. Michelin has used its Bead Tension Structure to increase ride comfort and provide more consistent handling. In this type of structure, two sidewall plies wrapped around each bead wire in opposite directions provide lateral stability, but enough flex to absorb road irregularities. Overall, Michelin Cross Terrain SUV tires perform among the best in their class. Handling and traction are excellent, and riding comfort is equally impressive. Add in one of the best warranty’s available for any tire, and this Michelin Cross Terrain makes for a solid choice in new tires. Prices for the Michelin Cross Terrain SUV range from around $196 for the 16 inch series tire to approximately $230 for the 18 inch series tire. Get the coupon below (if exist), or find other tire discounts. Who Are The Michelin Cross Terrain SUV Tires Designed For? The Michelin Cross Terrain SUV Tire is designed for drivers of SUVs, minivans and crossovers who are seeking a tire that will provide excellent traction and handling in any season, as well as provide a quiet and more comfortable ride. Michelin Tires provides one of the better warranties available on the Cross Terrain SUV tire. It starts with a 6 year or 65,000 mile treadlife guarantee. (If front and rear sizes are different, you get half the mileage guarantee) The tire’s uniformity is covered for one-year or the first 2/32 inch of wear. Materials and workmanship are backed for 6 years and include free tire replacement the first year or first 25% of wear. Michelin follows that up with a prorated amount down to the last 2/32 inch of useable tread depth on the tire. In addition, you’ll find a 3-year flat tire changing service at no extra charge. Michelin also gives you their 30-day customer satisfaction guarantee whereby you can refund or exchange the tires if you are not satisfied.